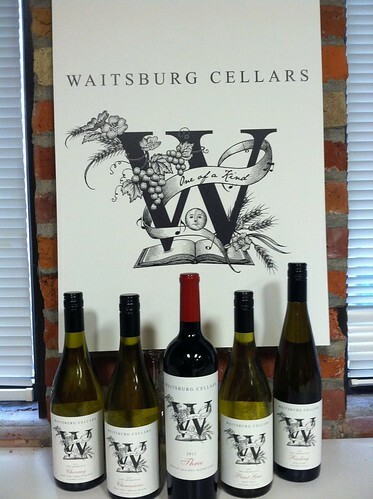 As I wrote on Monday’s blog, this was the day that the first five Waitsburg Cellars wines were presented to the media and the trade. Many of the people there asked if I was nervous, and I suppose I was, but if so, the nerves were somewhat subsumed by a rich mix of other emotions. All in all, it was an overwhelming sense of relief that took hold as the afternoon wore on. Relief that another important milestone had been reached, and the physical results of a year’s efforts were now out of the nest and on their own in the cold cruel world. Pour Fool blog, which carries a very thorough and entertaining account of the wines. Steve Body not only loved what he tasted, he loved the concepts at work here, and completely understood the target as well as the arrows. As for the size of my head, well, I’m happy to note it still fits into the fabulous Carlos Santana hat I purchased just a few weeks ago down in the desert. For those who have not followed the story, here is a quick overview. I am partnered with Precept Wine in the design and development of Waitsburg Cellars wines. I have been generously offered access to their vineyards, barrels, winemakers and winemaking facilities. My personal goals in this project are to learn as much about winemaking as possible; to create affordable, interesting wines that showcase Washington viticultural strengths and to some degree plow new ground (notably the Three red and the old vine Chenins); and to shine a light on my adopted home town of Waitsburg. These are NOT finished wines that were purchased in bulk and had a label slapped on them. They have been conceived and designed by me from the ground up. Cavatappi is handling the distribution of all five, which will be available in early April. There is also a website – www.waitsburgcellars.com – and a Facebook fan page, which I will keep updated. Lots more to come! ‘Handcrafted’ quality of OR wine appeals to US wine drinkers, says new study. The nuts and bolts of the report have not been released, and presumably will contain content of value. Meanwhile, some questions. Who was sampled? What was learned that wasn’t already known or completely intuitive? How will this impact future marketing of OR wines? Was Washington ignored as a comparable in favor of California? If so, is this an indication of some new competition? Why can’t Oregon and Washington work collectively; that would seem to make perfect sense. No answers today; I'll keep you posted. Congrats on your new label! So you'll be sending out samples for blogger review, right? I'm guessing WE won't review them, conflict of interest and all that, but I've got lots of spare points laying around if you need some.